Do you live in one of the best zip codes in America? Well, if you’re in one of the zip codes we’re about to highlight, odds are you don’t want to go anywhere. The purpose of this study is to use science to determine which of our great American zip codes are the absolute best. While unbiased, this research does take into account factors that almost all Americans would agree are desirable. Therefore, while you may have strong opinions either way, you can’t argue against the methodology. Turns out downtown NYC has the best zip code in the country. The worst? You might not be too surprised that a zip code in the middle of a Native American Reservation in Arizona takes the cake. So basically, downtown NYC, Boston, San Francisco or a Washington D.C. suburb are the best places to live. While that might be a surprise (and a real downer from the perspective of small town America), you can read on below to see how we crunched the numbers and how your zip code ranked or check out the worst zip codes in America. How do you decide if a zip code is awesome or not? In order to rank the best zip codes in the United States, we had to determine what criteria people like about a place. It isn’t a stretch to assume that people like low crime, solid education, things to do and a stable economy. If you’d like to see the complete list of the top 100 zip codes, scroll to the bottom of this post to see the abridged chart. This might be a little controversial, especially among middle America, but a zip code in downtown New York City is the best zip code in America. Why? While the cost of living is through the roof, there are plenty of jobs (almost everyone is employed), and plenty of things to do. San Francisco went from the cool place people moved to an overly populated, expensive home of technology. We agree with that. But when you factor in the rising real estate prices, easy to manage public transportation and abnormally high income levels, you can see why a zip code here is one of the most desirable places to live in America. Another downtown NYC zip code makes the cut, primarily due to exceptionally high home prices and a group of people who might be the smartest in the entire nation. If you’re one of the lucky 1,300-plus residents of a small section of Boston, you’re sitting pretty right now. This zip code in Beantown is pretty much opulent row – low crime, rich, smart people and close enough to downtown that you can ride your bike. Just right down the road from the 02199 is good ole’ 02110. They’re essentially the same thing except one is closer to downtown and one has slightly bigger, more expensive homes. Both are the place to aspire to if you’re a Bostonite. Plus, the sports teams always seem to do well in this city, right? If you had to live in the Washington, D.C. metro area, there’s no better zip code than this one. Surrounded by wealthy, smart neighbors, you’d pretty much be assured a job based on the unemployment numbers. The downside? A half hour to work each way a day, on average. Just right down the road from the 22213 is the very densely packed 22201. Is being in a zip code where there’s a ton of people a good thing? It is if you value lots of jobs, amenities and a sense of community. This very desirable zip code in NYC has a slightly higher unemployment rate, but is closer to downtown. Our final city in the greater D.C. area is again in Arlington, Virginia. If you can’t tell, this city is one of the wealthiest places on the planet, where success breeds success. The 10021 is the ‘average man’s’ zip code in New York City. We’re being sarcastic here – but if you wanted to live in downtown NYC, this would be your best option unless you’re in the 1%. And odds are, you’re not. Like we said earlier, trying to determine the best zip codes in America is usually a subjective matter. But if you’re analyzing zip codes with the best economic situations, where there’s low crime and lots of jobs, this is an accurate list. 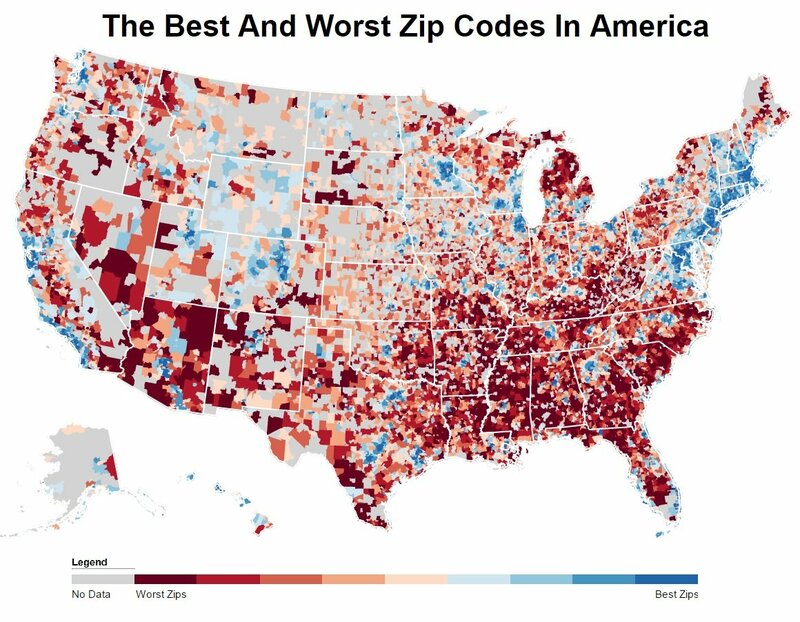 If you’re curious enough, here are the worst zip codes in the USA, according to science.